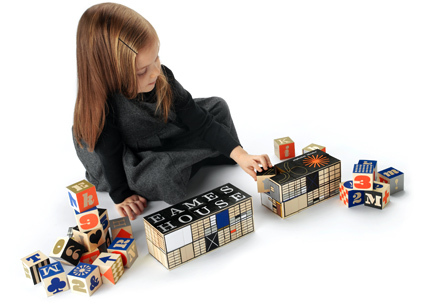 These Eames House Alphabet Blocks would be such a great thing to give to my architect hubby. A kid at heart (which is one of the things I love most about him), this is a great combination of fun, study, and form that makes for a great conversation piece. 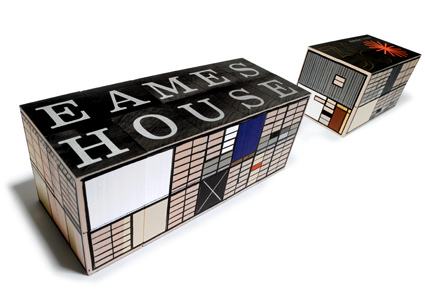 This is what House Industries has to say about their collaboration with the Eames camp: "Tours of the Eames House and Studio require a sizable donation to the Eames Foundation, but you can bring the Case Study No. 8 house to the convenience of your coffee table or kids playroom for less cash than dinner for two at the local upscale chain restaurant. It’s a bargain when you consider that each set of 36 replenishable Michigan-grown basswood blocks represents 29 separate hand-pulled screen passes. 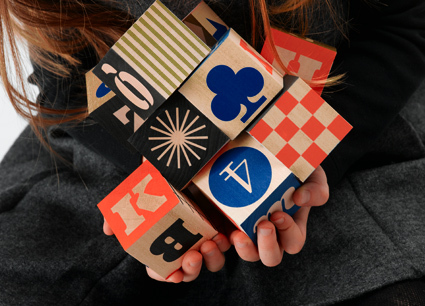 In the true Eames spirit, your kids can create a ligneous yard sale on your living room rug while you're in deep conversation with your guests, then build this living landmark to demonstrate how you are properly introducing them to important bits of culture. And, as a whole, they take up much less room than those awkward and unsightly Montessori toys." Hmm the last half of that paragraph is ultra-pretentious and hoighty-toighty, but I can just ignore that bit and oogle at the cool fonts, graphics, and colors on the blocks.